Cities are complex places. We need to embrace the complexity, and the difficult and sometimes painful feedback that comes along with it, if we want our cities to grow strong and resilient. That cities are complicated is obvious to anyone. There is a lot going on in a city, after all. There are roads and streets. There are homes and businesses. Cities are places where commerce occurs, jobs are held and goods are produced. There are old people and young people. Parks, churches and hospitals. It is all very complicated and to understand even one element of a city thoroughly takes years of experience and training. But complicated is different than complex. A Swiss watch is complicated – there are lots of moving parts that interact with each other in a very complicated way – but it is not complex. A complex system has an entirely different set of characteristics. A complex system is one that emerges from a collection of interacting objects, each of which experience feedback, are free to adapt their strategies based on their experience and are influenced by their environment. Pause for a moment and consider each of those insights. A complex system emerges, it is not imposed but instead appears, as if by magic. It is a collection of interactions between objects, any one of which we may understand but, when examined over time, very quickly become unpredictable. This is because these objects experience feedback; they learn from what they experience and change their behavior accordingly. And finally, these objects are impacted by outside events which they do not control or even necessarily fully understand. If you are a city manager putting together a budget for next year, an engineer making a traffic projection, a planner pretending to know how much of each type of zoning classification is necessary, an economic development advisor recommending a tax subsidy or an elected official receiving the collective wisdom of your professional staff, those last two paragraphs should scare the heck out of you. Why? Because cities are complex systems, and in complex systems the results can be extreme. Such systems react in unpredictable ways, going back and forth between conditions that are ordered and disordered. There is no direct relationship between inputs and outputs (do A and B will happen) and, while it might feel as if someone is in control, nobody is. Complex systems are emergent. Let me give an example: a city invests in widening a street to address a congestion problem and encourage economic growth. Maybe a business owner will buy a piece of land at a key intersection in anticipation of the traffic and the city will get a new gas station. Or maybe they can’t reach a deal with the owner of the land and instead choose to locate somewhere else. Maybe that other location has an existing gas station that now suffers from the competition and, as a result, lays off one of their managers. Maybe that manager takes the opportunity to go back to school and get a business degree, return to their hometown and starts a restaurant on the location the competitor gas station was supposed to go. Maybe the manager now restaurant owner winds up overpaying for the land and can’t make it, losing the restaurant to the bank. Maybe the bank president has a friend whose wife does yoga and wants to open a studio, so the bank unloads the property to her. Maybe the yoga studio is really successful, which prompts her to expand to a different location outside of the city limits. This could go on and on and on with an infinite number of permutations, all of which impact the outcome and none of which are directly correlated with the road widening. This is the essence of a complex system. Yet, we don’t treat cities as complex systems. We treat them as complicated systems, but systems that, like the Swiss watch, are ultimately knowable and understandable. We widen the road and we expect the gas station to show up there. We zone the land and we expect people to fill it accordingly. We give the business subsidy, prepare the budget, take on the debt and make the traffic projection will the full confidence that we not only know what we are doing, but that we can anticipate and compensate for any reaction others may have to what we are doing. It has puzzled me for a very long time as to why people who are clearly very intelligent don’t get this. In the “real world” when I’ve worked as an engineer or a planner and I make these observations about complexity, I am routinely ridiculed, where I am not ignored altogether. There is very little attempt to understand, let alone respect, the complex world in which we live in. Why is competition for limited resources so important in real world systems? The answer is simple. In real-world situations where there is no competition, it matters little what decisions people actually make. In other words, if there is an over-supply of desirable resources, then it doesn’t matter very much what we decide to do since we will still have enough of everything we need, and more. In such situations, we could each go around acting in whatever way we wanted, either cleverly or stupidly, and yet still end up with an embarrassment of riches. Hence there is no need to learn from the past, or adapt. The need for feedback then becomes pretty meaningless since we are all getting what we want all the time. The end result is that the collection of objects in question will behave in a fairly simple way. In particular, the lack of dependence on any feedback or interactions between the objects will make the overall system non-complex. In short, I’ve been wrong. Our cities in the United States are generally not complex systems, at least not today. Our affluence has made them – as Johnson describes – “non-complex.” Let me explain. I routinely see cities fix a street – new pavement, new sidewalks, etc… -- then come back a couple of years later and rip it up to replace the pipe underneath. Routinely. This seems insane. Can’t the department that fix streets talk to the people who fix pipes? They would if there truly was a resource problem. If there was scarcity and feedback. If they didn’t, in a complex system, they wouldn’t make it. The non-complex outcome is most evident in our response to congestion. Cities generally have one response: add capacity. Even now there are people reading this searching for another option, as if the only way to deal with congestion is to buy properties, knock down buildings and add more lanes. The High Five -- complicated, but not complex. In short, our affluence has given us a lack of feedback. We’re the fox who lives in the henhouse. We don’t have to think real hard. We don’t have to work real hard. There is little incentive to innovate. “In such situations, we could each go around acting in whatever way we wanted, either cleverly or stupidly, and yet still end up with an embarrassment of riches.” That’s America today – an embarrassment of riches. When I first drove the “High Five” between Dallas and Fort Worth – a collection of elevated interchanges that stretch high into the sky in the middle of a desert – my reaction was, “We are such amazing idiots.” I tried to explain this to the people I was with, but they were more impressed at the complicated engineering needed to bring elevated freeways together hundreds of feet in the air. 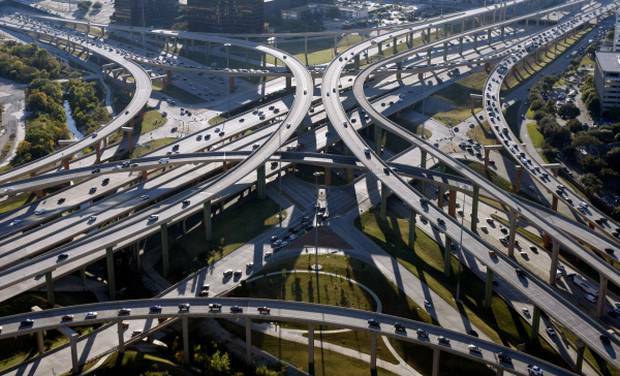 That this inelegant outcome was the chosen solution to the problem – highways coming together in the middle of nowhere and we can’t figure out what to do – was only made possible by the fantastic illusion of wealth we enjoy. Or at least, we are used to living with. Complex systems tend to disorder. A lot of the anxiety we feel in this country over our current trajectory is a fear of pending disorder. We want a world where we know what is going to happen. Where we can anticipate something and then it occurs as expected. There is a certain comfort in that, but it is illusory. We need feedback to thrive. Our cities are starting to get it.